The recent defeat of Proposition 37 in California has thrust what was once a little-known issue to the forefront of the food industry, causing much debate between its supporters and critics. The first initiative of its kind, Prop 37 received a flurry of feedback from consumers, small food companies, food professionals, and scientists, inviting everyone onto a playing field typically reserved for food industry leaders and government agencies. The legislation called for all foods containing genetically modified organisms (GMOs) to be labeled as such so consumers know what they’re buying. Prop 37 supporters believe the public has a right to know what’s in the food it purchases and that such labeling ultimately will help protect public health and the environment. Whether people voted for or against Prop 37, the close race indicates there are a large number of supporters who have no intention of giving up the fight for GMO-labeling laws. 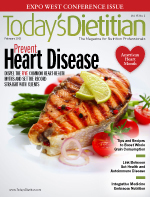 In this article, Today’s Dietitian interviewed RDs and food company executives to air both sides of the issue. Genetically modified foods—sometimes called “genetically engineered” or “transgenic”—are those made from GMOs whose DNA was altered through genetic engineering to make them insect resistant or more nutrient dense. As the technology to genetically modify foods improves and companies have greater access to the technology, the potential for GMO foods will be immeasurable. Yet potential, unknown risks exist with new technologies, and this has become a cause for concern. Selective breeding, she explains, is time consuming and doesn’t always produce the desired results. GMO technology is much more exact in that it “uses the knowledge of molecular biology to specifically transfer one gene that codes for a specific protein that will generate a desired trait in the plant.” These proteins, she says, typically have no effect or function in humans, especially those used in US crops that resist herbicides or insects. In addition to its monetary support of the right to know food act, Nature’s Path has contributed $150,000 to GMO OMG, a documentary to educate the public about GMOs, and is focusing on Washington State’s GMO ballot initiative I-522, which will require mandatory GMO labeling in that state. “We’re very disappointed in the failure of Prop 37, although we’re fairly confident this is only the beginning,” says Natalie Morse, a digital marketing manager for San Diego-based Chosen Foods, a functional food company that believes in ancient nutrition and the promotion of the chemical-free growing, harvesting, and processing of foods. According to Morse, GMOs “are the opposite of this effort” and are a risk to public health. Morse believes lack of voter education is one reason Prop 37 was defeated. But the future looks promising for similar initiatives being launched in more than 20 other states in 2013.5 She believes this will give voters more time to get informed. Concern about the cost of GMO labeling was a big part of the campaign against Prop 37. Opponents claimed the increased costs of labeling products would be passed on to consumers, making it difficult for food companies and consumers alike. Packard says it would be more expensive for food manufacturers to add more information on their labels, but that’s only one part of the issue. She says there would be documentation rules about tracing ingredients back to the seed, which will likely increase production costs. Not so, says Stephens, who cites European Commissioner for Health and Consumer Protection David Byrne’s 2001 Proposal for a Regulation on GM Food and Feed, which says the more than 50 other countries that label GMO foods have experienced no labeling related changes in food costs over the years. This first campaign to label GMO foods ended with the November election, but Prop 37’s defeat has done more to promote consumers’ right to know, continue the conversation—albeit controversial—and ignite passions in a growing number of other states where residents will vote on their own labeling initiatives this year. 1. Lederberg J, Tatum EL. Gene recombination in Escherichia coli. Nature. 1946;158(4016):558. 2. James C, Krattiger AF. Global review of the field testing and commercialization of transgenic plants: 1986 to 1995: the first decade of crop biotechnology. ISAAA Briefs. 1996;1:31. 3. Genetically modified foods and organisms. Human Genome Project Information website. http://www.ornl.gov/sci/techresources/Human_Genome/elsi/gmfood.shtml. Last updated May 17, 2012. 4. California proposition 37, mandatory labeling of genetically engineered food. Ballot Pedia website. http://ballotpedia.org/wiki/index.php/California_Proposition_37,_Mandatory_Labeling_of_Genetically_Engineered_Food_(2012). Last updated December 14, 2012.